Struggling US carmaker General Motors has announced a $9.6bn (£6.7bn) loss in the fourth quarter, pushing its net 2008 losses to $30.9bn. It said it used up $6.2bn in cash as it fought to stay afloat in the worst US auto sales environment for 26 years. The US's biggest domestic carmaker has been badly affected by a global slump in demand as cash-strapped consumers shun big-ticket spending. GM has already received $13.4bn-worth of federal loans since December 31. Revenue at the 100-year-old company also took a tumble, plunging more than a third to $30.8bn from $46.8bn in 2007. On Thursday, some of the firm's executives are in Washington to discuss GM's request for up to $30bn, in a bid to prevent it from going bankrupt. It has been kept going with the aid of government funds since the start of 2009. Consumers' fears about job losses, rising costs and banks clamping down on lending have all converged to dampen demand for autos and batter the industry. Meanwhile, the forecast looks bleak, with GM chairman and chief executive, Rick Wagoner, saying conditions this year would remain "challenging". 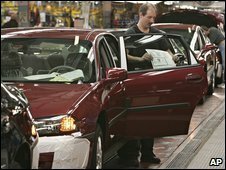 Commenting on the difficult conditions of 2008, Mr Wagoner said they "created a a very challenging environment for GM and other automakers and led [the company] to take further aggressive and difficult measures to restructure [the] business". "We expect these challenging conditions to will continue through 2009 and so we are accelerating our restructuring actions." In the light of the results - the second-worst in the company's history after the $38.7bn loss of 2007 - GM has now conceded that it expects auditors to raise doubts about its future viability when it releases its annual report in March. As well as the lack of global demand, GM is facing a host of other problems and has warned that pension plans for hourly and salaried workers were underfunded by some $12.4bn at the end of last year. Last week, GM and Chrysler asked the US government for further funding. General Motors said it would try to borrow up to $16.6bn more from the state. GM has also applied for emergency funding of up to $6bn from the governments of Canada, Germany, the UK, Sweden, and Thailand. GM said that it wanted to sell Saab, its Swedish subsidiary, but did not clarify the future of Germany's Opel, its other European carmaker. Amid these developments, Saab applied to enter a reorganisation process, seeking to create a fully independent business, and the application was approved by a Swedish court. Meanwhile, on Thursday thousands of workers from Opel plants around Germany took part in a rally at the company's headquarters in Frankfurt. They demanded that GM revise its plans to close some of its European plants. Germany's Vice Chancellor Frank-Walter Steinmeier said at the rally: "This is a fight for jobs and I'm fighting without any reservation for you." "This is about more than just Opel. It's about the future of the car industry in Germany. The car sector isn't just any ordinary industry here. It's the backbone of our economy." German politicians have been arguing about whether the government should rescue troubled Opel, disagreeing on the extent of the state's involvement.